You know you’re a writing geek when you’re ostensibly on vacation but still get up every morning to go sit in the lobby of the Hampton Inn and listen to the same tired tripe on Fox News while you drink your coffee and hammer just a few more words. The few more words turns into a few more and a few more and few more and the next thing you know you’re a page or so into the story and your Fruit Loops are six kinds of soggy. Oh, well. The nice thing about the Hampton Inn is their near endless supply of Fruit Loops and their 24 hour supply of coffee – both things any writer needs. My traditional tool for writing is an aging but relatively faithful ASUS ROG G-73. It’s been upgraded over the years, stripped to the bare frame, rebuilt, and reinstalled more times than I care to think about. It came stock with Windows Vista (may its name be forever spat upon), was upgraded to Win 7 (good OS, probably Microsoft’s best), upgraded to Windows 8 (not as bad as everyone says once you get Stardock’s amazing Start8 installed), and now runs a dual-boot configuration of Windows 8.1 x64 and Kubuntu Linux. It’s a beast of a laptop. If I don’t keep it plugged in I can usually pull a whopping 30-45 minutes before the battery gives up and goes home crying. 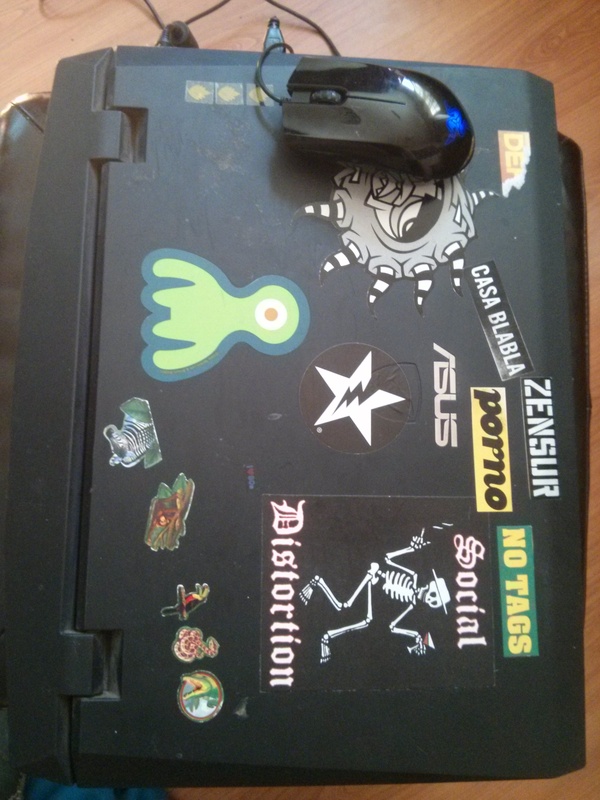 It’s covered with stickers that I’ve found over the years and then some my son decided to put on when he was four or five that I absolutely cannot get off, but it’s a pretty boss and bodacious system. The downside to it, other than the battery life, is it’s not exactly a small laptop. I had to hunt for a while just to find a backpack it would fit in and I can probably brain people with the power brick. Normally this isn’t too much of a problem but on our last trip to a wedding (Johnny and Eva, if you come across this we had a great time!) I decided to try something new and exotic. A few months ago I decided to upgrade my tablet to something larger because I’m getting older and my eyes weren’t happy with my little Nexus 7. 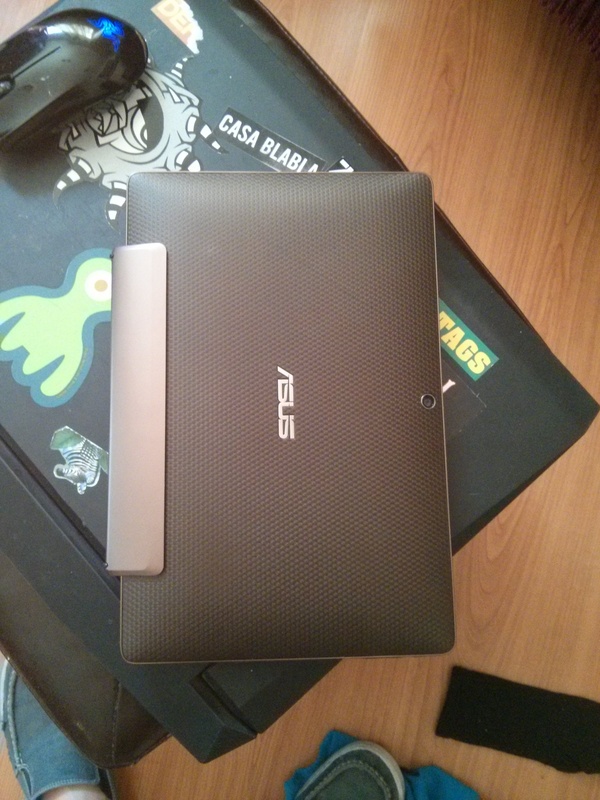 After some scrounging on eBay I found a nice ASUS Transformer tablet that came in under $100. Bam! 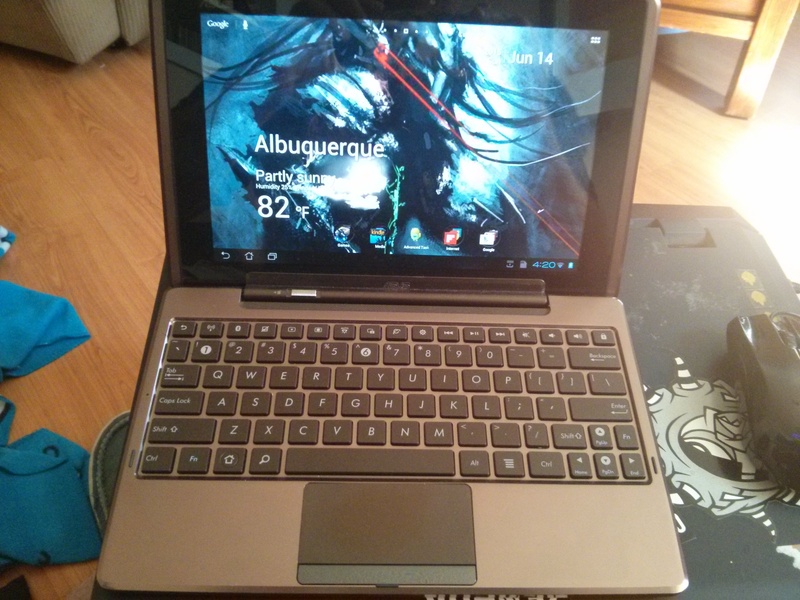 So, there’s a reason ASUS called it a Transformer tablet. Now I’ve got a little laptop that has an extra battery in the keyboard that gives it a battery life of around 24 hours or so. Documents to Go gives me Word functionality (I’d still like to see Scrivener on Android), Dropbox means I can get to my stuff wherever I need to, and a fully functional keyboard gives me a nice, portable writing platform. If I had a cell modem I’d be good to go. What did I write? I worked on Zona Peligrosa and almost made it to the point where Jack Bradford guns down a couple of meth-head thugs. Technology is a wonderful thing when it’s done right.